IIHS Top Safety Pick. Delivers 34 Highway MPG and 27 City MPG! 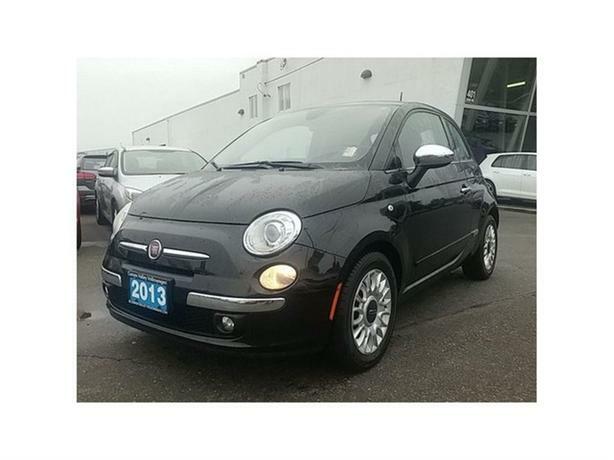 This FIAT 500 delivers a Gas I4 1.4L/83 engine powering this Automatic transmission. PWR SUNROOF, NERO (BLACK), ENGINE BLOCK HEATER. * This FIAT 500 Features the Following Options *22J CUSTOMER PREFERRED ORDER SELECTION PKG -inc: 1.4L I4 engine, 6-speed auto trans , COMPACT SPARE TIRE, BLACK SEATS, BLACK INTERIOR, LEATHER-TRIMMED BUCKET SEATS, 6-SPEED AISIN AUTOMATIC TRANSMISSION, 15 X 6 ALUMINUM WHEELS (STD), 1.4L 16-VALVE I4 MULTI-AIR ENGINE (STD), Vehicle info center, Variable intermittent windshield wipers, Tire pressure monitoring system. * The Votes are Counted *IIHS Top Safety Pick, KBB.com 10 Coolest New Cars Under $18,000. * Expert Reviews! *As reported by KBB.com: Cool, funky, fun and unexpectedly refined, the 2013 Fiat 500 bridges the gap between the sportier, pricier Mini Cooper and the more pedestrian Toyota Yaris. If you like a little car with attitude, and hear the call of Italian style sensibilities, the Fiat 500 may be for you. * Visit Us Today *A short visit to Comox Valley Volkswagen located at 401 RYAN RD, COURTENAY, BC V9N 3R5 can get you a trustworthy 500 today!